Alex Hutchinson is a fitness and travel writer, and a frequent Walrus contributor. He writes the Globe and Mail’s Jockology column. Reid Coolsaet is wide awake, sprawled the wrong way on his hotel bed so he can prop his legs up against the headboard. Outside the window, a strong breeze scuds briskly across Toronto’s Lake Shore Boulevard, along the very route he will be running in the morning. The gears of his mind spin restlessly, cranking out the mental arithmetic of kilometre splits for different paces and different scenarios. No Canadian marathoner has competed at the Olympics since 2000, but tomorrow several men are aiming for the London Olympic qualifying standard of two hours, eleven minutes, and twenty-nine seconds. And Coolsaet himself is aiming even higher, at Jerome Drayton’s national record of 2:10:09, set in 1975—the oldest record in the books. At thirty-two, Coolsaet has been a familiar presence at top Canadian races for a decade, his curly red hair and elbows-askew gait easy to pick out in any pack of front-runners. But his pursuit of the record will take him into new territory: he cannot afford to waste precious seconds by starting too slowly, or squander precious energy by setting out too fast. So he has been training for months with a pace of precisely 3:05 per kilometre over 42.2 kilometres in mind, drumming the required rhythm into his head and legs until it feels automatic. The race organizers have arranged a dedicated “rabbit,” a metronome-for-hire from Kenya whose only job is to help Coolsaet stick to this pace for as long as possible and then to drop out somewhere in the second half of the race. Far ahead, a phalanx of Kenyan and Ethiopian superstars will chase a time several minutes faster than the Canadian record, which is irrelevant to Coolsaet. His only adversary is the clock. Scott-Thomas is a methodical planner who has been grooming Coolsaet for this moment since 1998, first at the University of Guelph in Ontario, and then as part of the city’s Speed River Track and Field Club, each year pushing back the outer perimeter of the runner’s abilities in careful increments. But Scott-Thomas also knows that physiology alone does not determine race outcomes. “Sometimes we let our brains put too many riders on our own bodies,” he explains later. In fact, a wave of new research over the past few years has thrown into question the very existence of physical limits, as we currently understand them. Beneath Coolsaet’s apparent uncertainty, Scott-Thomas senses a seam of hard-earned confidence, so he gives the green light: “Why not? ” he says. “Go for it!” With months of strategizing abruptly discarded, Coolsaet heads upstairs, crawls back into bed, and within minutes falls fast asleep. Poke your head into any of the rooms along this corridor at the University of Cape Town’s Exercise Science and Sports Medicine research unit, and you will find more young volunteers being pushed to their limits in an endless variety of grimace-inducing ways: pedalling furiously, lifting, sprinting, or sweating in a heat chamber, all the while connected to panels of blinking, whirring electronics. Here, Albertus-Kajee’s boss, Tim Noakes, a controversial exercise physiologist whom some peg as the greatest of his generation, is building the case for a theory that would overturn almost a century of textbook physiology and reassert what generations of athletes have known in their bones: it is the brain that determines when we quit. At sixty-two, Noakes has greying temples and a near-permanent grin. A competitive rower as an undergraduate, he only discovered running when a rowing practice was cancelled due to high winds. He decided to run around a nearby lake, and after forty minutes was overcome with a feeling of euphoria—the classic but elusive runner’s high. 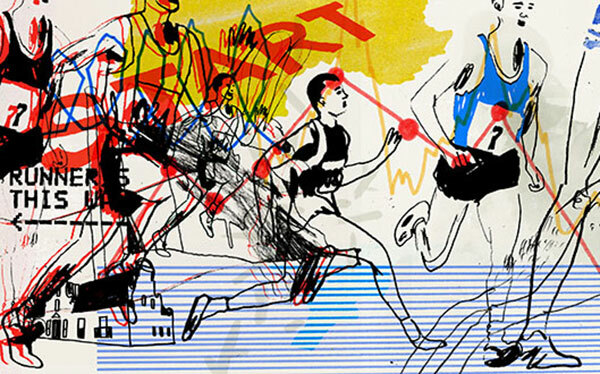 Thanks in part to this quirk of brain chemistry, he quickly became hooked on the new sport, and ultimately shifted his professional interests from clinical medicine to running-related research. His penchant for “paradigm rattling,” as one colleague refers to it, emerged early: in the 1980s, he was the first to identify the potentially fatal risks of drinking too much water during exercise, more than two decades before this was widely acknowledged. He also penned the enduring pop-sci classic Lore of Running, which earned him acclaim beyond the halls of academia. Noakes proposed that the brain is wired to protect itself by pre-emptively shutting down your muscles before any part of your body reaches total failure. If your muscles are being depleted of oxygen and your heart is working too hard; or if you are becoming dangerously dehydrated; or if your core temperature is rising excessively; or if you are climbing a mountain and the amount of oxygen reaching your brain drops significantly—in all of these situations, a “central governor” in your brain acts to slow you down or stop you before you do irreversible damage. You stop not because you can’t physically go any farther, but because your brain thinks you shouldn’t. Albertus-Kajee’s experiments illustrate how the brain applies the brakes before your muscles fail. The volunteer in the dentist’s chair (actually a high-tech force measurement tool called a dynamometer) is performing a two-minute maximal voluntary contraction test, pushing as hard as he can with his leg. The force produced by his muscles has steadily diminished over that period, as expected, but so has the EMG measurement of electrical activity. In essence, his brain is betraying him by requesting fewer and fewer muscle fibres in his leg to contract. When the two minutes finally end, he gets a scant five seconds of rest, and then Albertus-Kajee asks him to push again for just five more seconds. Amazingly, the force and EMG measurements spike back almost to their starting levels. Whatever caused the gradual decline in force, it could not have been the muscle fibres in his leg: they are still working fine. That does not mean muscle fibres can keep contracting forever. If you take an isolated muscle from a frog, put it in a petri dish, and apply a jolt of electricity to it (as physiologists did in the first half of the twentieth century), the muscle will contract. And if you deliver that jolt repeatedly, the response will decrease and eventually stop: total muscle failure. Experiments like this, using isolated muscle tissue or brain-dead lab animals, produced the conventional understanding of muscle fatigue. The problem with this picture, points out Carl Foster, a professor at the University of Wisconsin–La Crosse and past president of the American College of Sports Medicine, is that “we are not decerebrate cats.” Instead, Noakes argues, our brains pick up distress signals from the muscle fibres and stop demanding contractions long before the fibres fail—an arrangement that just might leave us with some wiggle room. Nobody in the press truck says anything after the first kilometre. The race started with the usual exuberance, thousands of runners surging across the start line and down University Avenue like lava from a long-plugged volcano. I am hanging out the window of a vehicle driving forty or fifty metres ahead of the field, watching along with the other journalists covering the race as the front-runners begin to coalesce into distinct packs: the East Africans in the lead, then the Canadian Olympic hopefuls, then the top women, the top regional runners, and so on. As the kilometres tick past, I start to exchange puzzled glances and raised eyebrows with a few other reporters. Before long, the whole truck is buzzing with confusion. Fifteen minutes into the race, the eleven-man lead pack forms a ragged arrowhead across the road, with top contenders such as defending champion Kenneth Mungara and Nixon Nipkoech Machichim, both of Kenya, tucked behind their pacemakers. And at the back of the pack, an incongruous shock of red hair is clearly visible. Coolsaet, wearing a black New Balance singlet with red stripes down the sides, seems to be running comfortably. As they streak past a banner indicating the five-kilometre mark, he looks down at his watch, clicks a button, and stares at the display for a few strides, then carries on with the leaders. It’s official: he has abandoned the careful plan he outlined at the pre-race press conference two days ago, and is running to win. The other contenders are, on paper, much faster than Coolsaet: all but one have already run faster than the Canadian record, in some cases by several minutes. (This is not a rare feat: in 2011 alone, ninety-three Kenyan and thirty Ethiopian men ran faster than the Canadian marathon record.) But there is a more subtle reason that his strategy is causing a stir among the seasoned observers on the press truck: the typical pattern that emerges at big road races does not break down simply along the lines of who is fastest. Even second- and third-tier Kenyans will run with the lead pack for as long as they can, looking for glory—and a paycheque—or bust. Many will slow dramatically or drop out later in the race, but a few will hang on for an unexpectedly high finish. If you are trying to break out of crushing poverty, it is better to win one race and drop out of another ten than to finish fifth or sixth many times in races where the money only goes to the top three. For Coolsaet, on the other hand, success will be judged almost exclusively by the clock: he will pocket a $36,000 bonus (and a small but tangible slice of immortality) if he breaks Jerome Drayton’s record, no matter how many Kenyans cross the finish line ahead of him. Similarly, other top Canadians, like Coolsaet’s Speed River training partner Eric Gillis and Kingston, Ontario, native Dylan Wykes, are set on making it to London by hitting the Olympic standard. They have dreamt of this since they started running; it is why they started running in the first place. Behind them, most of the other people in the race are focused on personal goals rather than on trying to beat those around them. In crude terms, these are “First World goals”: it’s about pacing, not racing. According to conventional physiology, steady pacing is the most efficient way to ration your energy stores. Its logic has been taken for granted since Aesop and his tortoise. But it is inherently limiting: to run at an even pace, you have to decide on your final finishing time, and thus set a ceiling on your potential achievement, before the starting gun fires. As a result, even pacing may produce better results on average, but it is less likely to produce dramatic outliers: jaw-droppingly fast (or slow) times. A 2006 study by Noakes and two colleagues confirmed this suspicion. Looking at the pacing patterns in a sample of men’s world records set at 5,000 and 10,000 metres, they found that the first and last kilometres were significantly faster than any other in sixty-five of the sixty-six records. To break a record, in other words, you must find a way to transcend conventional physiology. Just before the ten-kilometre mark, filmmaker Paul Trebilcock, who is shooting a documentary about Coolsaet, pulls up alongside the press truck on his bicycle. “How is it out there? ” one of the reporters shouts out the window. The runners are nearing the end of a long, exposed seven-kilometre stretch straight into the gusts that rattled Coolsaet’s hotel windows last night. Trebilcock shakes his head. “It’s windy,” he yells back. “You can really feel it.” Coolsaet is sheltering at the back of the lead pack, now down to ten runners. Gillis, Wykes, and the other pursuers are almost out of sight now. Despite the wind, the leaders are on pace to run 2:07:40—two and a half minutes faster than the Canadian record. When physiologists discuss feats of great endurance, the metric they fixate on is maximal oxygen uptake, or “VO2max.” The roots of this obsession stretch back to 1923, when Nobel Prize-winning physiologist A. V.Hill performed an experiment in which he measured the amount of oxygen his muscles were consuming as he ran at successively faster paces. As expected, the faster he ran, the more oxygen he used. But he eventually hit a plateau: though he could keep accelerating for a little while, his oxygen uptake would not budge any farther. The reason for the plateau, he concluded, was that his body had reached some physical limitation in its ability to deliver oxygen to his muscles. He could not pin down the precise location of the supposed bottleneck—lungs? heart? muscles?—but researchers and coaches nevertheless enthusiastically adopted VO2max as a scientific measure of human endurance. Shephard’s critique—which points out the lack of any smoking gun evidence for the existence of the central governor—is hard to counter. Even if we peer inside the brain during strenuous exercise and try to catch the governor in action, what, exactly, are we looking for? We do not have, as some critics have mockingly claimed, a homunculus (or “little man”) inside our heads deciding when we should stop or go. The first tentative steps to answering that question come from Swiss researchers, who recently found promising evidence of changes in brain activity that precede physical exhaustion, in a region called the insular cortex. Meanwhile, Noakes is collaborating with researchers in Brazil, who have built a Rube Goldberg-esque contraption that allows subjects to pedal an externally mounted bicycle while lying supine in the cylindrical bore of an MRI magnet; the researchers are now trying to determine which parts of the brain light up when we tire. Noakes believes the trail will eventually lead us to the most primitive parts of the brain—perhaps to circuits based in the evolution of foraging behaviour, which required a complex balancing act between the benefits of pushing farther to find more food versus stopping to conserve existing energy reserves. For now, such evidence remains out of reach, so his most persuasive arguments are of the “dog that didn’t bark in the night” variety. He takes the predictions of orthodox exercise physiology, compares them to what happens in real life—and, grinning triumphantly, points out the contradictions. A classic situation in which athletes believe they have hit a true physical limit is “bonking” during a marathon: you stagger to a halt, ostensibly because your body runs out of carbohydrates. When Noakes started running in the 1970s, the standard advice was to drink only water during long races. Then, in the late stages of a sixty-four-kilometre race one year, he tried a few spoonfuls of corn syrup. “Five minutes later, I just started running. I finished that race faster than I ever finished,” he recalls. “It was like the brain released something.” The discovery led to the first external funding (“a thousand rand in a brown paper packet,” he says) for his nascent sports science lab, to study the effects of corn syrup on participants in South Africa’s Stellenbosch marathon. The fact that the corn syrup worked seems to support the idea that the body is limited by its finite store of carbohydrates. But it almost worked too well, and Noakes began to question whether carbohydrates could even reach the muscles that quickly. Sure enough, recent experiments in Britain have shown that your brain picks up the presence of carbohydrates in your mouth via previously unknown sensors, anticipates that fuel is headed to your muscles, and allows you to go a bit faster—even if you trick it by spitting out the carbs rather than swallowing them to replenish your muscles. In another British study, cyclists who were given acetaminophen before a ten-mile time trial finished 2 percent faster, presumably because the drug partly blocked the body’s distress signals to the brain. And cyclists in a 2011 heat chamber study only slowed down at 31 degrees Celsius when they knew how hot it was; when thermometers were rigged to display a lower temperature, the heat didn’t affect their performance. As the evidence piles up, it becomes hard to deny that the old “brainless” view of human limits, nearly a century’s worth of textbook material, is incomplete. Says American Society of Exercise Physiologists co-founder Robert Robergs of Noakes’ influence, “Most of the younger breed of exercise physiologists, in which I would group myself, recognize that, boy, some of his challenges are correct.” In the end, that’s how paradigms finally shift: the old guard is never convinced, but eventually retires. Shortly after the halfway mark, Coolsaet has fallen behind the leaders. He hit 21.1 kilometres in 1:03:58, still on pace to break Jerome Drayton’s record by more than two minutes—but in such a long race, the first half amounts to little more than a prologue. The hardest running will take place in the second half, and as Coolsaet disappears from our sightlines on the press truck we shake our heads knowingly. We are disappointed but not surprised: after his aggressive start, a fade was inevitable. The only question now is whether his two-minute cushion will be enough. To most observers, it seems puzzling that our top marathoner in 2012 still struggles to dispatch the ghost of his 1975 counterpart. Drayton was a stud—he set the record in winning the Fukuoka marathon in Japan, then considered the unofficial world championships, and won Boston two years later—but he also worked full time as a civil servant in running’s pre-professional era. We know so much more now about nutrition, hydration, recovery, and all of the other sub-domains of sports science. Yet Canadians have, if anything, become slower. To understand why, consider a set of records from another sport with a long and illustrious history: Thoroughbred racing. Despite all of the progress in various areas of physiology, winning times at major races like the Kentucky Derby and the Epsom Derby have remained stagnant since about 1950, according to a 2006 analysis by University of Nottingham researcher David Gardner. Over the same period, winning times at major marathons such as the Olympics dropped by 15.6 percent, and 10,000-metre times by 13.5 percent. A champion marathoner and a champion horse are both physiological marvels; the difference is, the marathoner understands that he is in a race. In a study published last year, researchers asked experienced cyclists to ride all out for 4,000 metres on stationary bikes in a virtual-reality lab. The subjects then returned to the lab twice more to compete against a virtual avatar that represented their first performance. Not surprisingly, the “competition” spurred the cyclists to finish a bit faster, beating their previous bests by 1 percent on average, a significant improvement for a trained athlete. But on one of the return visits, the researchers secretly sped up the virtual avatar by 2 percent. Faced with a task they believed (or thought) to be physically feasible, the cyclists struggled valiantly and improved their performance even more, by 1.7 percent. All three races were “maximal,” but competition—just like the Tylenol or the rigged thermometers in other studies—enabled the human racers to make incremental gains, pushing back the limits set by their central governors in a way that no horse ever could. Of course, if competition spurs improvement, its absence has the opposite effect. Blame video games, or the rise of other sports like soccer, or the search for newfangled training shortcuts instead of old-fashioned hard work; for whatever combination of reasons, starting in the 1990s Canada, along with most of the Western world, produced fewer elite runners. And with less competition, times got slower. The turning point came in 2008, when, after years of forcing demoralized athletes to chase increasingly elusive time standards, Athletics Canada announced that it would dramatically loosen its standards so it could send a full team of five marathoners to the 2009 World Championships in Berlin. Competition among Canadians, rather than against the clock, would determine the team. Icannot help but view the central governor theory through the lens of the years I spent negotiating with my own limits on tracks and courses around the world. I grew up reading about the pursuit of the four-minute mile—how it stymied such runners as the Australian John Landy (who famously ran 4:02 and change six times before declaring, “It’s a brick wall. I shall not attempt it again”); and how the floodgates opened after Roger Bannister finally broke the mark in 1954. Landy ran 3:58 just seven weeks later, and fifteen others followed within three years. As a high school runner, I was eager to break a lesser version of that barrier, for 1,500 metres, about seventeen seconds shorter than a mile. Like Landy, I ran 4:02 and then hit a wall, running similar times again and again over the next four years. My breakthrough didn’t come until my third year of university, in a small, meaningless race on one of the slowest indoor tracks in the country, at the Université de Sherbrooke. The key: the francophone timekeeper hospitably switched to English for the mid-race splits he was calling out on each lap. The delay of several seconds in his translation led me to believe that I was running far faster than usual, with no apparent increase in effort. This unintended deception spurred me on, and I finished in 3:52, a nine-second personal best. In my next attempt, I ran 3:49, and in the race after that 3:44, which qualified me for the Olympic trials. If I could have bottled the magic of that sudden transformation, I would be—well, if not rich, then at least much faster. Unfortunately, knowing how the brain holds us back or spurs us on does not tell us how to harness it. We can formulate some specific principles from Noakes’ research, such as focusing on competition rather than on the clock, but really his work encourages a different overall mindset: whatever challenge you undertake, you will not encounter a true physical limit. Sure, it’s a semantic shift, since the limits imposed by your brain may prove just as intractable. But it can alter, almost imperceptibly, the horizon of what you consider possible. Just before thirty-five kilometres, as the runners head up a short hill on Queen Street East, Coolsaet surges into the lead. There are just four runners left in contention: Coolsaet, Mungara, Machichim, and Ethiopia’s Shami Dawit. As Coolsaet presses ahead, Machichim begins to drift back, losing contact with the group; he later drops out. Machichim had run 2:08:22 at this same race one year earlier; Coolsaet has broken him. The leaders will now be running straight into the wind for the remainder of the race. Coolsaet’s quads are burning, and his stride starts to look slow and jerky. He grimaces and shakes his head as Mungara and Dawit pull away, but he cannot respond. Soon the gap balloons to ten seconds, then twenty, then forty. Two kilometres from the finish, the press truck pulls off course and accelerates to the finish line, where we wait impatiently for the outcome. It is now virtually certain that the record will elude Coolsaet, but the journalists are still buzzing: the feat of running stride for stride with Mungara and Dawit for thirty-eight kilometres on a miserable, windy day has unmistakably altered his position in the running firmament. Mungara is already a 2:07 runner; Dawit will go on to run 2:05 just three months later, this past January. Coolsaet, meanwhile, will spend January in Iten, training at the epicentre of Kenyan dominance. One Thursday morning, he joins over 200 Kenyan runners, ranging from complete unknowns to established stars, for a fartlek workout along the dusty mountain roads outside town. The task is simple: alternate two minutes hard with one minute easy and repeat twenty times. Just as in races, everyone goes out hard and hangs on as long as they can. No one wants to be behind the lone mzungu, but Coolsaet still manages to work his way up and finish near the front. As he jogs back toward town, caked in red dust and sweat, a handful of the other runners burst into applause. He is ready to run 2:05, they tell him. Not this time, though. Hundreds of fans are lined up behind the barricades along Bay Street, yelling and ringing cowbells as Mungara out-leans Dawit in a furious sprint to win in 2:09:51. A minute and four seconds later, the noise intensifies as Coolsaet crosses the line with a resigned smile. He accepts congratulations from the race director, and from Peter Butler, the man he has just displaced as the second-fastest marathoner in Canadian history. And then he turns back toward the finishing straight and starts yelling. When I visited Tim Noakes in Cape Town, I asked him for the most important piece of evidence in favour of his theory. He had just completed a study that demolishes the vaunted concept of VO2max as a “physical limit,” by demonstrating that minor changes to the test protocol produce higher-than-maximum values. But his answer turned out to be simpler than that: the “end spurt,” as he calls the furious sprint unleashed in the final metres of a long race. Noakes’ pacing study showed that world record setters not only start fast; they also finish fast. This U-shaped pacing strategy appears to be hardwired in us, and has been observed in kids by the age of eleven or twelve. “It shows that our understanding of fatigue is totally wrong,” Noakes said. If fatigue stemmed from the progressive failure of our muscles, the finish would inevitably be the slowest part of the race. But it’s not. In the distance behind Coolsaet, Eric Gillis has been waging his own battle against the wind. Fair haired and hollow cheeked, he has dropped Wykes and the other runners from the second pack, leaving him with no one to shelter behind. With a kilometre to go, he checks his watch and realizes that his quest for the Olympic standard balances on a razor’s edge—that it will be a question of seconds either way. From that point forward, he focuses on leaving absolutely nothing in reserve. He cannot feel his legs, so he concentrates on pumping his arms with a looping, exaggerated motion, struggling to stay upright. Finally, he turns the corner onto Bay Street and steals another glance at his watch: exactly twenty seconds left. He needs to accelerate. Time crawls; I can hardly bear to watch as the announcer leads the crowd in a final countdown. At last, with a lunge across the line, it’s over. Gillis will join Coolsaet in London, having qualified with just 0.7 seconds to spare. Reid Coolsaet and Eric Gillis qualified for the Olympics at the Scotiabank Toronto Waterfront Marathon on October 16, 2011. Six months later, Dylan Wykes ran 2:10:47 in Rotterdam, qualifying as well. This appeared in the July/August 2012 issue. Holly Wales contributes to a weekly column, Lives, in The New York Times Magazine.